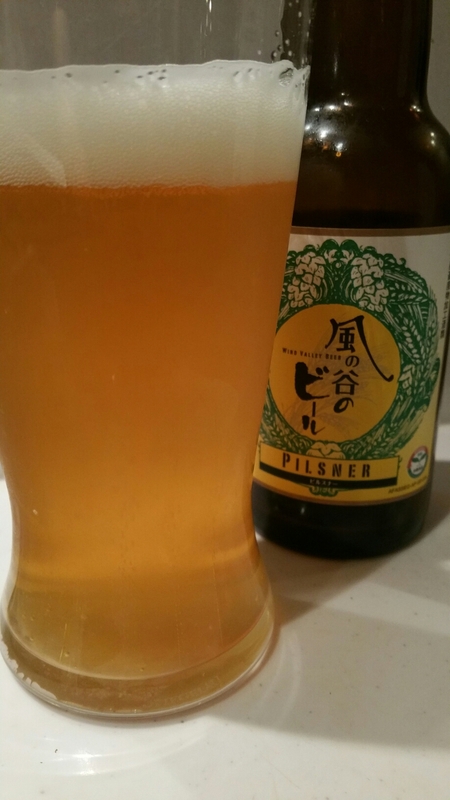 Wind Valley Pilsner is a 5% Czech style pilsner from Kaze no Tani Brewery, based in Shizuoka, Japan. It’s part of their all-year round lineup of craft beers, and like the rest of their range, has been classified as organic. It was the first beer in Japan to be classified as such, way back in December 2000. At the time of writing, Wind Valley Pilsner can be found in both bottles and on tap, though the latter option isn’t that wide spread yet. Wind Valley Pilsner poured out a light straw-like colour with a reasonable amount of frothy white head. It had a slightly lemony orange citrus aroma with some bready malts coming through. When it had warmed up a bit, the malt aroma was more prominent and bolder than I expected from this pilsner. The body had a tasty, crisp character to it though the it was a tad watery in the texture. There was nothing really wrong with Wind Valley Pilsner; it had smooth sweet flavour to it and an edge of bitterness to it that was balanced well but it wasn’t really outstanding or anything different from something from the big four. Wind Valley Pilsner’s aftertaste was a slight sweet edge with a bit of dryness to it. Wind Valley Pilsner is a well-made pilsner but nothing outstanding. My wife bought me a few of these bottles, and I like them. A good pilsner, and crispy. I did not notice any sweet aftertaste. Compared to last night, when Super Dry was the only beer that was available, I really enjoy this Wind Valley Pilsner. Much better than the one last night. Will get a new bottle now!